Viper Head Gen II in shield is 3 1/4 inches wide by 3 inches tall. 450HP sticker is 6 1/4 inches wide by 1 7/8 inches tall. The sticker is only what you see in silver. Sticker has no background. 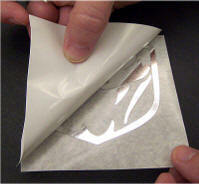 Extremely shiny chrome stickers, sticks to plastic, metal, paper and most non-oily surfaces. Best results use inside out of weather. Set includes; one (1) High Polished Chrome Viper Head and one (1) HP450 sticker set. Sticker here shown against a black board. 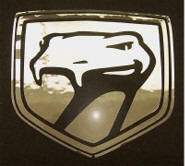 Set includes; two (2) High Polished Chrome Viper Head stickers and two (2) HP450 stickers. These stickers are the same size of the ones above.